The park is to be on the banks of the Ganges, in the north Indian pilgrimage town of Haridwar. It is where the Hindu god Vishnu is said to have left his footprint. The town attracts more than 18 million visitors a year. "There is a huge amount of pilgrim traffic in Haridwar," says Shiv Sagar, the project's chief executive. "People come to take a bath on the bank of the Ganga river because it is a Hindu belief that this cleanses a person." "But after they take a bath there is nowhere for the pilgrims to go to learn about Hindu stories. "Gangadham is a spiritual theme park where children and families can go and have a good time, while learning about stories from Hindu mythology," Mr Sagar says. Construction of the park is due to start later this year. Mr Sagar hopes it will be ready by 2007 - in time for the next Kumbh Mela. 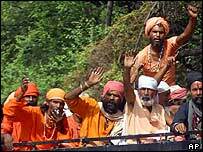 This huge religious festival will take place in 2010 and is forecast to attract up to 50 million people. Although the mix of religion and entertainment may seem unusual, Shiv Sagar is no stranger to the combination. 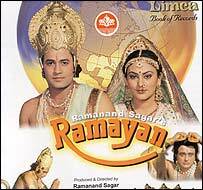 His grandfather, Ramanand Sagar, produced and directed the hugely popular TV serial Ramayan. The dramatisations of Hindu mythology were broadcast around the world in 60 different languages. An estimated 650 million people tuned in to watch. "Gangadham is based on the work of my granddad. The idea has been so popular because people already know Dr Sagar's work and know he shows the Gods in a respectful and devotional way," Mr Sagar told the BBC. Shiv has also enlisted the help of Alice Coltrane, the wife of legendary Jazz musician John Coltrane. "Alice is a very spiritual person and runs an ashram in [Los Angeles]. She knows our family well and stays with us when she is in India. She is one of the main investors in the park," he said. 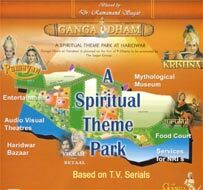 Mr Sagar argues that Hinduism is a religion versatile enough to adapt to theme parks and TV shows. "The Hindu religion is well suited to something like this, religions like Islam are not allowed to depict forms but we have many different forms and representations of Gods," he said. But Gangadham does have its critics. Some say making the Hindu Gods into figures of fun is disrespectful. Devas Samaroo, a Hindu priest and doctor based in London, disagrees. "If a theme park means to expand on the pantheon of Hindu philosophy, to bring understanding to people within a limited area, to spread the knowledge of so many deities and aspects and qualities of god... I don't think there is anything wrong with a theme park," he said. Other people criticise the park for being built on the Ganges - there are strict regulations to prevent building on the banks of the river in Haridwar. The aim of the project is to build on 25 acres just by the river. "We have the full support of the government of [the state of] Uttaranchal in terms of all the regulations and other such aspects. They are very keen that this project comes to Haridwar," Mr Sagar says. The park is not only aimed at domestic tourists. Shiv realises the park's potential in attracting the 25 million Indians living abroad. A centre is also being planned that will enable Indians living abroad to set up remote pujas and other rituals over the internet. News of the park caused excitement at the Eelapathhswarar Hindu temple in Wembley, North London. "This project sounds unique and I would like to go with my family. If I am alive I will definitely be there for the Kumb Mela!" said Bahi Jayadeyan, chairman of the temple. Although the park is rooted in Hinduism, Mr Sagar wants to attract visitors of other religions too. If the project takes off, it will move on to an international level. The plan is to open parks in Trinidad, Bali, Fiji and Thailand - and perhaps even Orlando, Los Angeles and London.